Bento Brunch: ever heard of it? Well to say that we have would be a little bit of lie. In reality, I have heard about some places that started offering it but, as soon as they would start they would close down or cease offering it. The word Bento has its roots in Japanese slang for “convenient”. Bento is associated with a single packed meal, kind of like brown-bagging for lunch but in Japanese-style. I know what you’re thinking and it’s true, one would not normally associate brunch with Japanese cuisine but that’s the beauty of brunch; it has the possibility to change and be adapted by multiple cultures. Bento brunch has recently made its appearance in town and seems to have finally stuck. 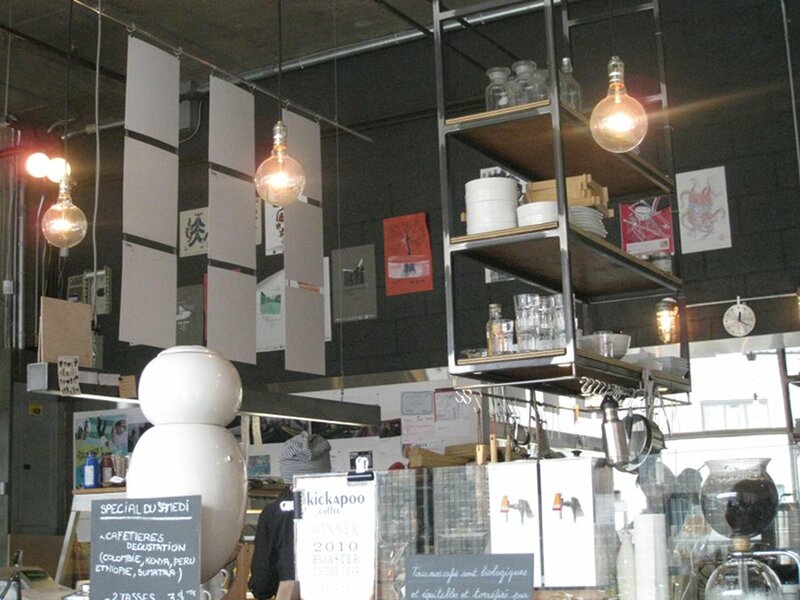 Café Falco is one of those restaurants that has come on the scene and started to offer Bento brunch. I have always been curious about this and after seeing that it survived a couple months, I knew it was worthwhile checking out. Right off the bat, finding this place is not the easiest thing because it is in an area that is devoid of restaurants. It’s actually in a manufacturing shipping dock area so it seems kind of out of place, It is located on the ground floor of an office building where even the washrooms are in another area. 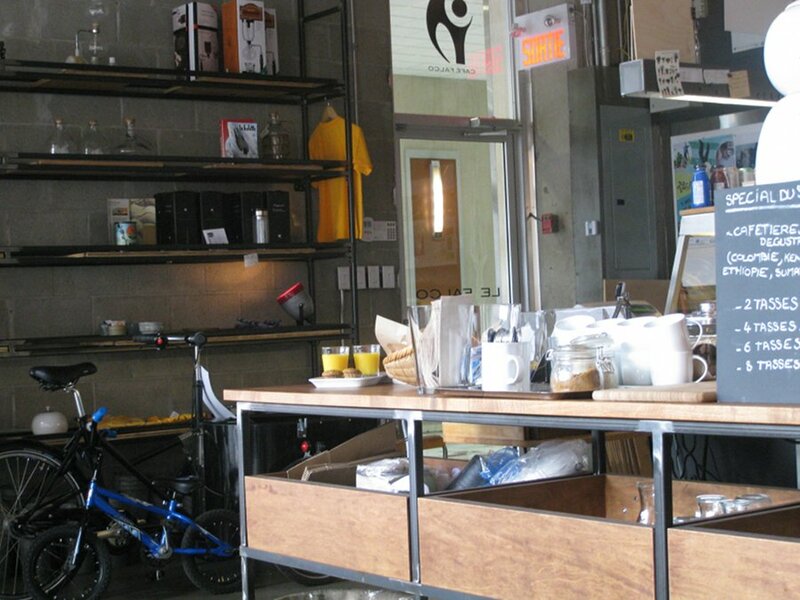 The inside of Café Falco is eclectic, to say the least, with it’s tall ceilings and random items on the north wall where you are greeted by an order counter and cooking area. 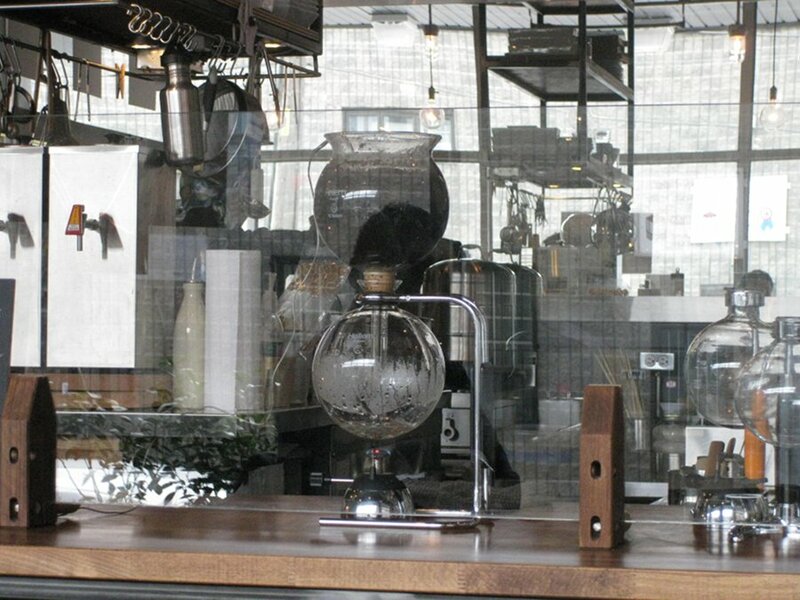 They have siphon coffee which is coffee done with a Bunsen burner-type contraption. It’s cool to look at and makes a decent coffee. So basically, you place your order at the counter and then you get your food. There are no refills, no table service – just order and sit. There are some individual tables and a large common table at the back that can sit almost 20 people. It’s a nice way to make friends or have an entire group there – just make sure to get there early. The menu is straightforward as there are 2 items besides some sides/snacks. 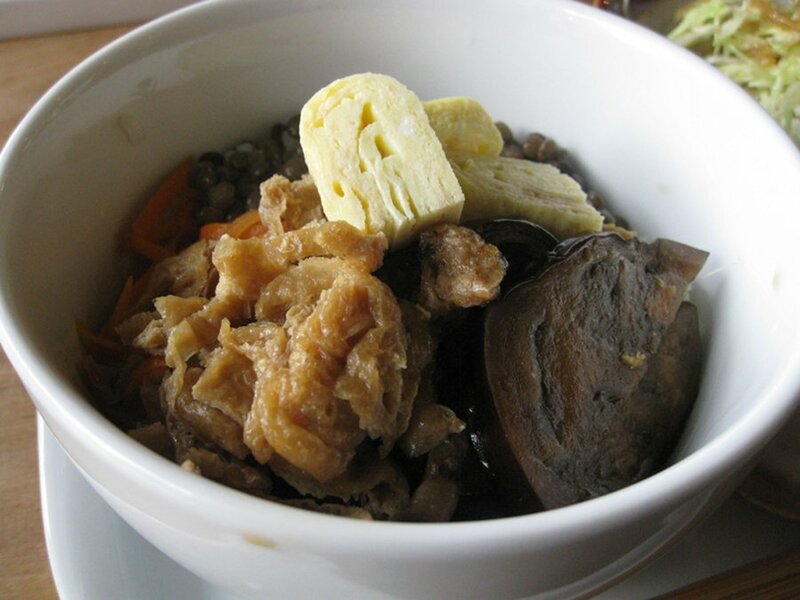 The price is $18.50 and the 2 items are Pork Sautéed and Ginger or Eggplant and Fried Tofu. Each dish comes with a tea or coffee, a mini muffin, soup, salad and a small glass of orange juice. 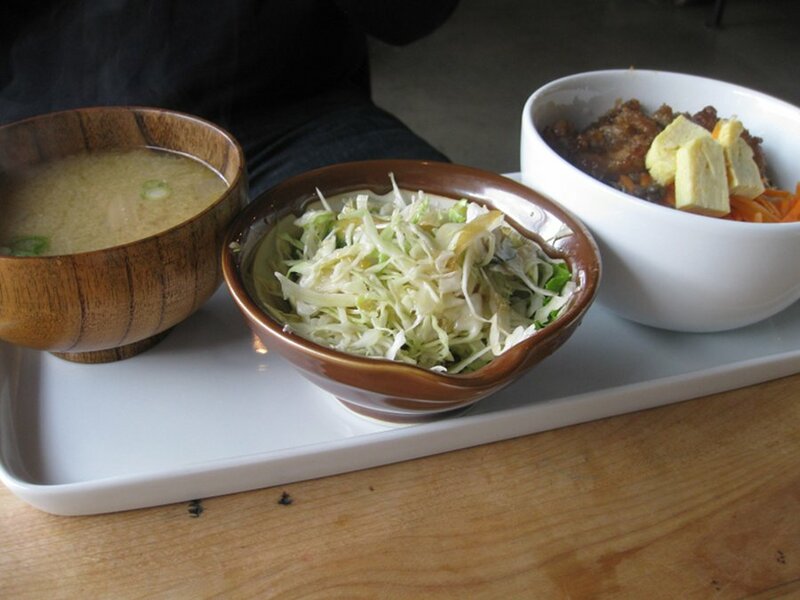 My friend had the sautéed pork option which had a miso soup, a marinated cabbage salad. The dish was in a bowl on a base of rice with carrots and some veggies in the mix. 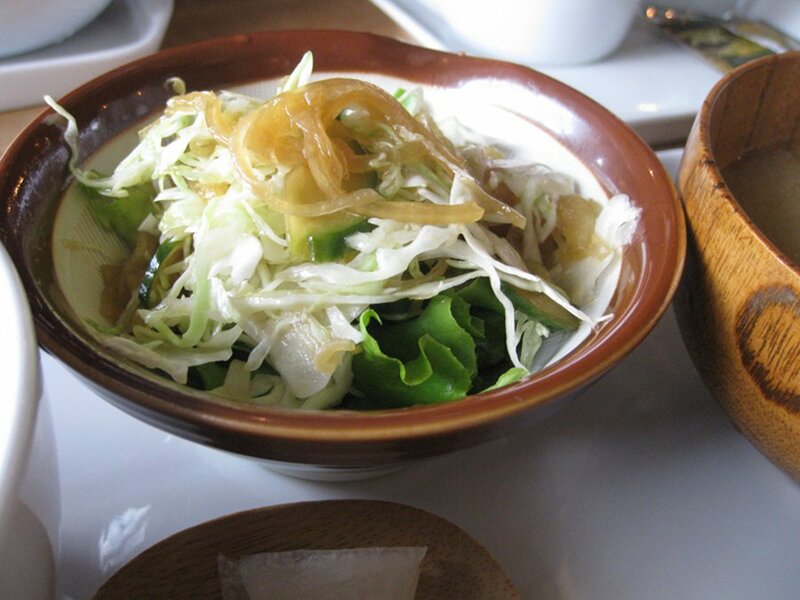 It also came with a marinated daikon on the side of the bowl. The soup was good and simple. It doesn’t come with spoons so we slurped it up and it made for a fun experience. The cabbage salad was nice and was not over-marinated. The pork itself was tasty and you did get some good pieces. I, by default, ordered the marinated eggplant which was similar to the pork dish except for the eggplant. The eggplant was a nice vegetarian option although, the pork one was more filling, I kind of wish they had a third option which was a combination of both. That being said, I was very happy with my choice and liked that it was vegetarian friendly which is always a bonus in my books. Our service interaction was limited besides taking our order and serving our food. The staff was polite from what we saw. With one of the two main dishes being vegetarian, I can actually say they offer a 50% vegetarian brunch. The eggplant options offers something unique and tasty for vegetarians out there. From what I saw in the vegetarian plate, I think it can qualify for vegan as well since there is no egg and dairy but I would double check on that before ordering. Café Falco is a fun experience although, the menu is very limiting and a little on the expensive side. 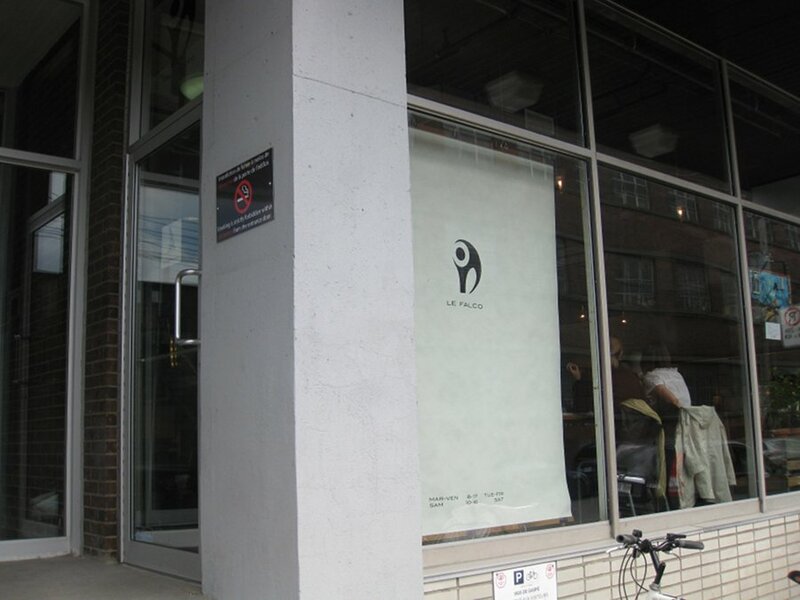 If you are famished and are price conscious, this may not be the best spot for you. 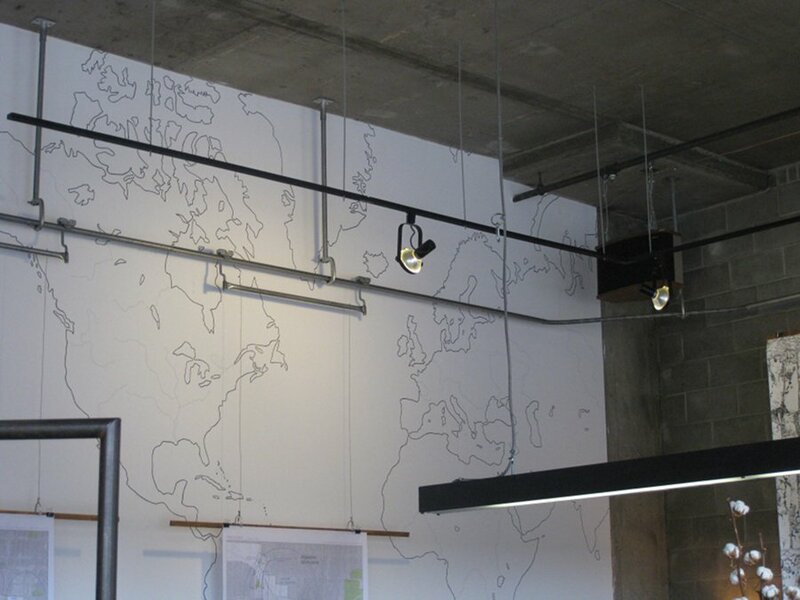 The décor is very nice and funky and the siphon coffee is fun to watch and makes a decent cup o’joe. I’m glad that I tried it but I don’t know how soon I will try it again. Overall, it is definitely an experience to be had.